Malaysian police have increased security around churches in Penang state after one was hit by petrol bombs in a row over the word "Allah". Banners reading "Jesus is the son of Allah" were hung on several churches on Sunday, including the one targeted. It is not clear who was behind the attack. Church leaders deny putting the banners up. The attack is seen as a reprisal. People of all faiths use Allah in Malay to refer to God, but a court ruled last year that non-Muslims must not do so. The appeals court ruling in October said that Allah must be exclusive to Islam or it could cause public disorder. It overturned a 2009 decision pertaining to the use of "Allah" in a local Catholic newspaper, which sparked attacks on mosques and churches. Christians in Malaysia argue they have used the word, which entered Malay from Arabic, to refer to their God for centuries and that the ruling violates their rights. And church leaders have remained defiant and said they will continue to use Allah in their worship. Nobody was injured in this latest attack and the church was not damaged, but there are fears that tensions could escalate as they did in 2009. Earlier this month, Islamic authorities seized more than 300 Malay-language Bibles from the office of a Christian group because they used the word Allah. 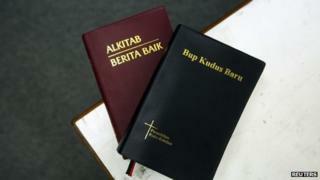 Bibles in the Iban language, which is used by an indigenous group on Borneo island, were also seized for using the word Allah.